So sadly we don't live by the beach, but Jayden loves to play in the sand. We have a small sand box in the back yard and every time we are at the park Jayden darts for the sand. He can sit and play in the sand forever. That means often we have sand in the car or tracked into the house. But recently I came across Sand Gone. 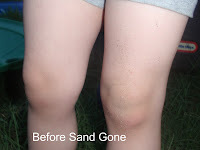 SAND GONE is a dry body powder that, when applied to sand covered skin, removes the sand and leaves the skin soft and smooth while feeling fresh and clean. 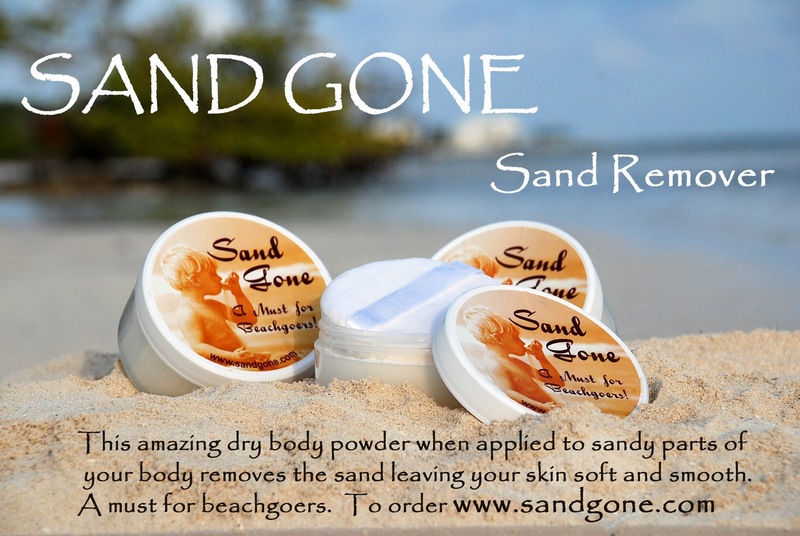 Sand Gone comes in an 8oz jar and has a microfiber applicator. The applicator can be washed in the washer and dryer in your home. The dry, white powder is both non-toxic and non-talc. Sand Gone has a coconut scent. 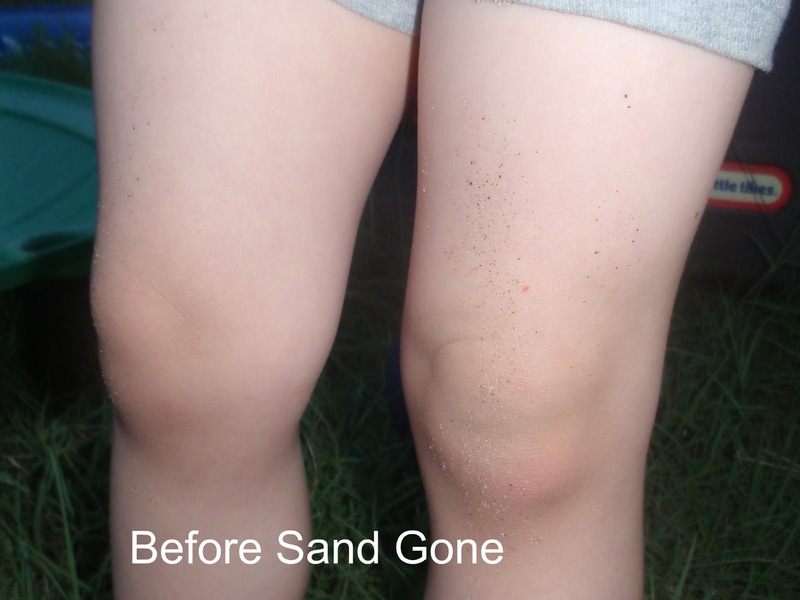 Additionally, Sand Gone can be used to remove salt from your skin after spending time in the ocean. We used Sand Gone on Jayden after he played in his sandbox. He had some sand on his legs so I tried the Sand Gone to remove it. It worked quickly and easily. I loved the scent of it. It reminded me of the beach. The Sand Gone was very easy to use and it removed the sand easily. 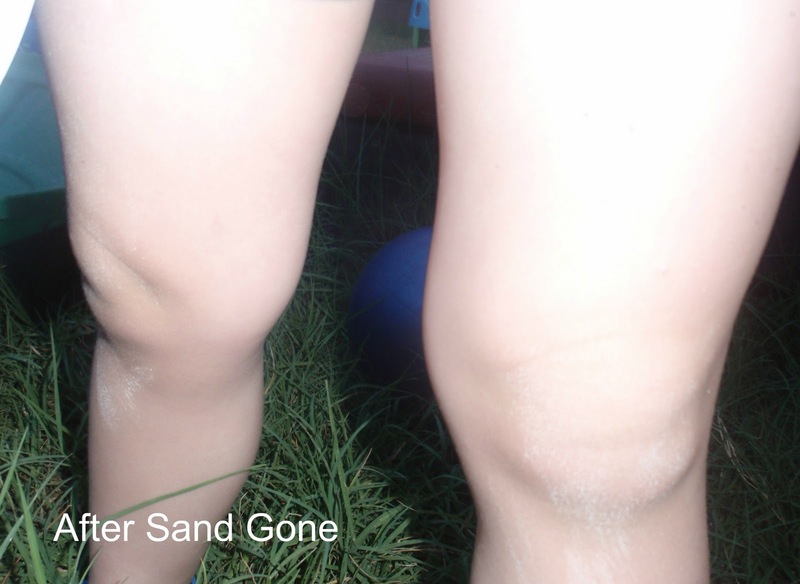 Jayden's legs were left with a soft white powder that brushed off easily. Now I think I need another jar of Sand Gone. I want to keep one near the back door for play in the backyard sand box an one in my car for those stops at the park. I would definitely recommend this product. The only thing I didn't like is the wide mouth jar. I worry about dropping it or when Jayden insists on doing it himself. In those cases then spilling it everywhere would not be fun. 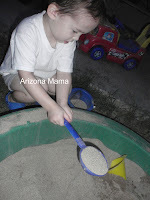 Win it: 1 Arizona Mama reader will get a jar of Sand Gone to try them self. Enter to win in the Rafflecopter form below!! I find the whole concept interesting! I'd love to try it to see if it really works myself! LOL I hate getting sand in the car when we go to the beach! I learned that it has a coconut scent.... that sounds really nice!! Very interesting that it not only removes the sand but the salt too so the scratchy feeling is gone. Never heard of this before. I found it interesting that "When the powder is brushed on sand convered skin, the sand just falls off. Your skin feels silky and clean without feeling wet or scratchy."